For the vegetable grower, winter can be a frustrating time of year with several weeks still to go before the official start of the growing season. If you’re craving fresh home-grown produce, good news: many vegetables can be sown by late winter to give a super-early start. Peas can germinate at temperatures as low as 39 degrees Fahrenheit (4 degrees Celsius), which makes them an excellent starting point. Growing peas for shoots is an easy way to get a fresh hit of flavor within just a few weeks. Pea shoots taste just like peas and are packed full of nutrients. Pick a vigorous, tall-growing variety to give plenty of leafy growth. 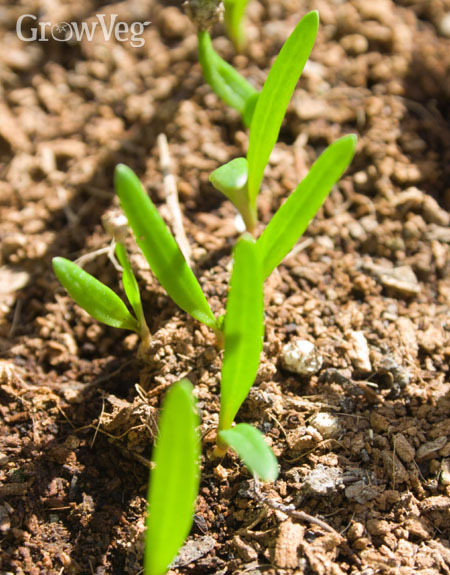 Start the seedlings off in a greenhouse or cold frame, sowing two to three seeds per pot or module cell. Once the seedlings have filled their modules they can be planted out to leave 8in (20cm) between each clump. Cover the newly planted shoots with horticultural fleece to help them get going. Pick little and often by snipping off just above the second set of leaves. Many leafy salads such as winter-hardy lettuces and endive can be sown inside a greenhouse or cold frame, or under row covers or cloches. Alternatively you can sow into modules and grow on before planting out into greenhouse borders or containers. Space plants at least 10in (25cm) apart to give them plenty of room. Pick just a few leaves from each plant at a time to avoid exhausting the plant. Other early-rising salads include Oriental leaves such as mizuna and mustard, cilantro, corn salad (also known as lamb’s lettuce or mâche), and the fleshy leaves of winter purslane (miner’s lettuce). Starting off cabbage this soon in the season has its advantages: slugs are thinner on the ground and you’ll enjoy a cut of vitamin-rich leaves by early summer – way ahead of spring-sown cabbages. As with any early-sown vegetables, choose varieties suited to sowing in cooler weather. Sow into module trays then plant out once the young plants have established, usually within four to six weeks. Plant them 9in (22cm) apart. Spinach is ready to sow under cover from late winter, as light levels start to improve from their midwinter low. Spinach is crammed full of vitamins and iron, making it a valuable crop for health as well as taste. Sow directly into containers of potting soil or into modules or pots for planting out a few weeks later. Set three to four seeds per module for planting out 6in (15cm) apart. When the plants are growing more vigorously you can pick a few leaves from each plant at a time, allowing replacement leaves to grow. In this way you’ll enjoy several harvests from each plant. Hardy varieties of green onions, also known as scallions, can be sown directly into fertile, well-drained soil. Sow seeds thinly in rows 6in (15cm) apart. The seedlings shouldn’t need thinning out if they are sown thinly enough. You can also sow three seeds per module to plant out at 3in (7cm) apart in both directions. Place covers over your green onions to help them along. Depending on your local climate and weather, the first stems will be ready by mid spring, when most gardeners will only just be starting to think about getting them underway. In most cases you will need to offer your early risers some form of cold protection – particularly in snowy regions. The main priority is to raise the soil temperature high enough for successful germination while holding off the worst of frosts. Greenhouses and hoop houses (polytunnels) trap the heat very efficiently, making them several degrees warmer, especially on sunny days. They create a microclimate that’s at least one month ahead. Cover seedlings with bubble wrap or horticultural fleece to trap daytime heat overnight. Young plants raised in pots or modules will need acclimatizing to colder temperatures before they are planted outdoors. Cold frames can make a handy halfway house. Lift off the lids during the day then replace at night. Do this over the course of a week to ready them for planting. Outdoors, row tunnels, cloches or horticultural fleece will help lift the growing temperature enough for newly planted or direct-sown vegetables to thrive. Lay covers over the ground at least two weeks beforehand to raise soil temperatures in advance and reduce sudden cold shock. It doesn’t take much to protect plants from hungry pests. In most cases starting seedlings under cover will avoid slug and mouse damage. Make it easier to spot and destroy slugs by picking off any dead or yellowed leaves and by keeping the ground between plants free of weeds, then check regularly after dark or lay beer traps to drown them. If mice become a problem under cover you may need to resort to a few strategically placed humane mousetraps - or talk nicely to the neighbourhood cat! Outside, birds such as pigeons and sparrows can attack young shoots of vegetables such as cabbage and peas. Don’t let them compromise your early start – set up netting covers if necessary to keep your crops safe. With a little protection from the cold there’s no reason to delay sowing until spring. Sneak a head start and you’ll be harvesting fresh produce weeks in advance. Please share your own experiences of growing extra-early vegetables by leaving a comment below. "Broccoli is my favourite vegetable, and its great that it can be an early starter! I wrote a bit of a growing guide on how to grow it in Autumn... http://bit.ly/1tyCJSP"
"What will stop rabbits from eating my garden I'm going to plant.I live in California high desert." "One way to avoid rabbit damage is to erect chicken wire fencing all the way around your vegetable garden - ideally a couple of feet tall and, if you can, buried a foot into the ground too (so at least three foot tall in all). You could also use row covers, which as well as protecting against insect pests and birds, will put off rabbits." "I was told by an old time farmer that moth ball keep the critters away... "
"Can I start seeds in garage without grow lights ? Just with garage door light ?" "It depends on how bright it is and also how warm. My hunch would be that it is probably too dark in a garage and the seedlings might become drawn and pale. Ideally look to start them off on a bright indoor windowsill." "This past season I used fruit tree netting over tube hoops on my square foot gardens (raised beds) to keep rabbits, squirrels, birds, etc away from seedlings. It works very well." "Hi Nancy. Physical barriers like that are a great way to keep most of the major pests off. And with the hoops in place, you can always swap the netting for butterfly netting, mesh or fleece to keep insect pests off. Thanks for sharing."